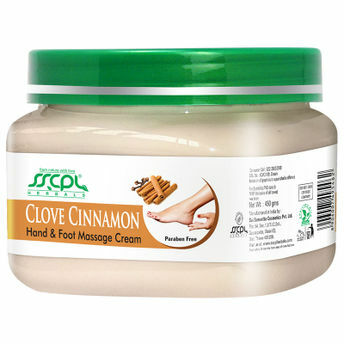 The hand and foot massage cream is infused with the goodness of clove and cinnamon oils. It deeply goes into the skin and moisturises it; it also helps to fight sagging skin, fine lines and wrinkles. It also helps in increasing the collagen levels and gives you a beautiful and healthy hands and feet. This unique cream has skin firming, exfoliating, antiseptic and cleansing properties. The stress busting properties in it are also helpful in reducing fatigue and anxiety. Explore the entire range of Foot Care available on Nykaa. Shop more SSCPL Herbals products here.You can browse through the complete world of SSCPL Herbals Foot Care .